Google accepts Atom feed from blogger as sitemap xml. Today, I submitted Atom feed of this blog to the Google Sitemaps. To my surprise, after 3 hours I got an OK message in the sitemap tool. Looks like Google has accepted this feed and may have crawled the website today. I will keep a close eye on the cache dates of my site and post if Google crawls the site in the next couple of days. I am expecting a deep crawl this time around. I hope all my individual pages get crawled and indexed so they can appear in the search engine results page. Last year, Google came up with rel=”nofollow” tag to counter the increasing amount of link spamming done by bloggers. Now, Google needs webmasters to point out the pages it needs to crawl. There is also a speculation floating around that Google is using humans to evaluate the search results. What is going on? Is Algorithm is not doing its job correctly? Are Google engineers losing the battle against black hat SEO tactics? Time will tell. Anyways, news of the day is that Google Sitemaps accept the Atom feeds from the blogger blogs hosted at blogspot.com. Does blogger blogs ever rank well on the search engines? I have seen many blogs show up on the search engine results page, but most of those blogs are hosted on the personal web sites. I have also noticed that these blogs are created using Wordpress, Movable Type or Typepad. The blog you are currently reading is on blogger and I hardly get any visitors from Google or Yahoo. Searching the Google with my blog’s title brings my blog at the bottom of the first page, but not all of the post pages are individually indexed in Google. I can see the URL of the individual post pages in the Google results page but I don't see any title or description of the page, which indicates that Google knows about these pages and it has spidered the pages but somehow decided not to index them. If you do site:discretelife.blogspot.com in google, it brings up all the pages in my site. But, many of these pages are listed URL only. No title and description is shown on the search engine results page. Only a few pages are listed with their respective title and description. If this continues for a long time, then it is worthless. The title only pages have less chance of getting visitors from search engines. It may be that Google applies some kind of ranking penalty to the free blogs hosted at blogger. This makes me wonder that if I ever want to put up high quality, researched articles on the web than blogger is not the right choice for me. I should buy my own domain name and host my blog on my own web hosting account. If you publish high quality, thoroughly researched articles in a blog then publishing XML feed is bad! If you want your site to disappear from the Google, Yahoo, MSN and other search engines then do not publish your content through the feed!! What are you talking about? The XML, RSS, and Atom are the new buzzwords of the year and these things are hot. Why are you saying they are bad? This is bad because when you publish your site in XML format, other people can scrap and copy your content, and make money of your hard work. There are hundreds and hundreds of scrapper sites out there whose webmasters find XML feeds from various blogs, and display that entire original content without any regard to copyright laws. They put Google Adsense ads around these content and make the buck easy way. Some scrappers are so bad that they don’t even put the link to the original site from their copycat site. One other thing concerns me here is the “Duplicate Content Penalty” imposed by Google and possible other search engines. When the bots of different search engines crawl the web, they also notice the number of sites with the identical content. If these bots find the same identical content on more than one site it may apply ranking penalty to the sites in question. This will bring the search engine ranking down for the original blog, and search engine traffic will slowly dissipate reducing the total number of visitor to the blog. See, the search engine bots do not know which site is original and which site is copycat. So, what a publisher can do to protect his or her original content? Well, there are not a lot of things someone can do. Entirely stopping the feed publishing is an option, but I guess not the smartest one. I believe, the XML feed should only consist of the partial content; the title of the post and a little snippet of the post. I believe the snippet should be less than 100 characters or first couple of sentences. The scrappers can still come to your blog and copy and paste your content to their sites, but at least they are not getting free lunch with XML feeds. I visited Sandy Point State Park on Chesapeake Bay last weekend. I thoroughly enjoyed my one-day visit to the “beach”. 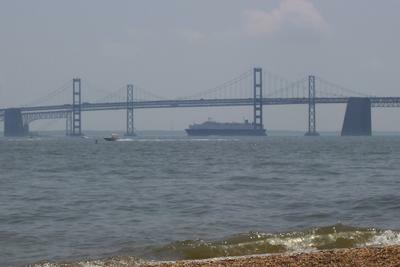 The Sandy Point State Park is located on the western end of the bay bridge, which connects the eastern shore of the Maryland to the “main” Maryland. Going eastbound towards bridge on Route 50, the park is the last exit before the bay bridge. The main attraction of the park is the mini beach it contains on the shore of Chesapeake Bay. The beach is about a mile long. As the name suggests the beach is mostly “sandy” with some “stoney” patches mixed in. There are areas for swimming and fishing designated and separated from each other. The park also has boat-launching ramps. I saw many people launching their private boats in the Chesapeake Bay from these ramps. Rowboats and motorboats are also available for renting from within the park. There are benches and tables scattered throughout the park for dining purposes. The atmosphere was family friendly at the Sandy Point State Park. There were lots of families with children enjoying the summer sun and a dip in the beach. I liked the park a lot and will be visiting many times in the future.